The Three Bears, a minor series of cartoons Chuck Jones directed at Warner Bros. in the late 1940s. 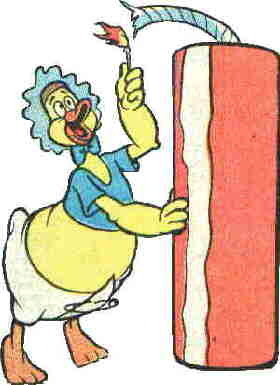 But the characters best known for those traits are the family of Baby Huey, whose creation is attributed to animator Marty Taras (Rags Rabbit), who designed the character. Huey's family may have been totally derivative of the Jones creation, but they lasted far, far longer. Huey continued to appear in Famous Studios cartoons, directed by Sparber, Seymour Kneitel or Dave Tendlar, until Famous sold the character, along with Little Audrey, Herman & Katnip and all the others it owned, to its then-current comic book licensor, Harvey Comics. The last Baby Huey cartoon they released was Pest Pupil, directed by Tendlar, which came out on January 25, 1957. Harvey was the second comics publisher to license the Famous Studios characters, including Huey. The first, St. John Publishing Co., put out only one comic with Huey in it — Casper the Friendly Ghost #1 — but that comic, dated September 1949, has the distinction of containing the real first appearance of Baby Huey. Apparently, the story was prepared from advance production materials, enabling it to appear on the stands months before Huey's first cartoon hit theaters. That's an odd distinction Huey shares with Disney's José Carioca and Donald Duck's nephews. Harvey took over the Famous Studios license in 1952, and made Huey a part of its anthology comic, Paramount Animated Comics. With its seventh issue (February, 1954), Huey became its permanent cover feature and his logo appeared larger than the comic's actual title. From #9 on, Huey's logo almost crowded the original off. Paramount Animated Comics ended with its July, 1956 issue. The first issue of Huey's own comic, Baby Huey the Baby Giant, was cover dated September of that year. After buying the Famous Studios characters, Harvey began to produce cartoons of their own for the TV market. Huey has been animated several times in the ensuing years, and can sometimes be seen in out-of-the-way time slots on out-of-the-way channels. The most recent was a 1994 syndicated series, produced by Carbuncle Studios. His main venue in all this time has been the comic books. The comic thrived during the 1950s and '60s, spinning off such ancillary titles as Baby Huey & Papa (1962-68) and Baby Huey Duckland (1962-66). It faltered during the '70s, but managed, in fits and starts, to make it to 1980. After another brief sputter in 1990, it finally bit the dust. The character uttered one last gurgle in comics during the late 1990s, when he made regular appearances in a magazine devoted to the Harvey characters; but that magazine, too, is no more. Huey was last seen in a very low-budget, live action feature-length film, which was released direct to video in 1998. The future could be more of the same, or it could be — who knows? The company says it has plans for the character, but doesn't say anything specific about what they are. Text ©2000-07 Donald D. Markstein. Art © Harvey Entertainment.